Well, worth the masking price? | What Hi-Fi? Well, worth the masking price? Trouble is, in the immortal words of one Norman Stanley Fletcher, you don't half feel a nurk wearing it. The idea is sound enough: anyone who's listened to their system late at night with all the lights off will know that it tends to sound better, and we've all seen listeners at hi-fi shows closing their eyes to concentrate better on the music. The common explanation is that, in computing terms, vision is pretty processor-intensive, so we hear less well when we see. Or, more to the point, our hearing is more acute in the absence of visual stimuli. It's the reason why, for example, I always do at least some of my testing of AV surround-sound systems with the TV turned off: without the picture, it's easier to concentrate on the sound coming from the speakers, and of course having a strong visual indicator of where a sound should be coming from can make one less aware of how accurately that sound is being steered to the appropriate speaker. Surely, then, you can turn off the lights, or just close your eyes? 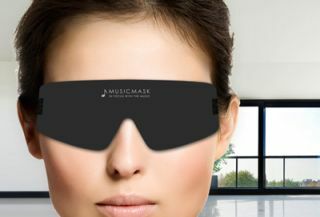 Not so, say the makers of the Musicmask: the fact the device keeps the masking piece off your eyes with foam surrounds means you can keep your eyes open behind it, which makes you more alert, and thus able to listen better. The design of the Musicmask thus rules out the argument that you could just use that sleep-mask you shoved in your pocket last time you flew long-haul: one of those sits right on your eyes, and is designed to be used with your peepers closed behind it. So, Musicmask, then. It'll cost you $44.95, or around £30, with a ten-day money-back guarantee, and was 'developed by Corly Bedacht, a music lover from Amsterdam, the Netherlands. 'The idea for Musicmask came about during a meditation session in a dark meditation room. From personal experience, however, I'd suggest not by hi-fi reviewers whose partners assess and objectively compare their sanity when they suggest they're going to sit and listen with the thing on.